Back in the saddle, so to speak. And that has nothing to do with horses, I've been in that saddle almost every day lately. I haven't been very on top of things with scrimshaw lately so I need to get crackin. It took some time to get things arranged into a scrim-friendly configuration again. I decided I could not stand doing scrim on the vise, I even rigged up this neato little wooden gizmo and glued my old mouse-pad on there. Turned out nifty but the whole stand has a bit of a wiggle to it (because hey, bar stools aren't really meant for this job, it's rather top-heavy now) and that drives me insane when I'm doing scrim, though I don't think I'll notice it while engraving (time will tell). I'd sit there and try to work and just go bonkers and get frustrated and accomplish nothing. Anyway, I'm back to working on the tabletop for scrim, so that just means moving 40+ pounds of vise/turntable out of the way and pushing the scope back a little. It's do-able, though kind of a pain in the asterisk. 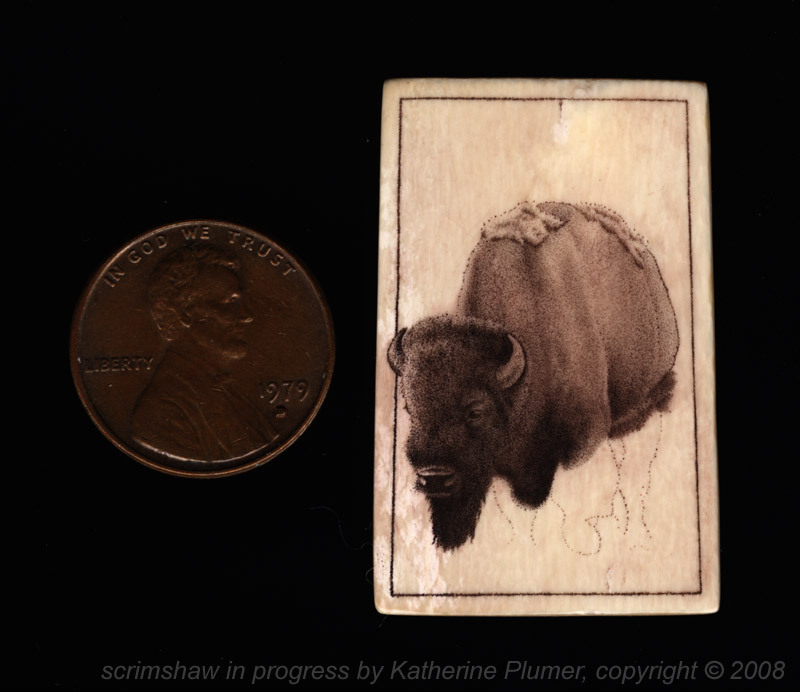 Anyway, I need to get this little bison finished up.